Medicine and Technology: How Do You Become a KOL? How Do You Become a KOL? What's a KOLs (stands for key opinion leader)? They are generally physicians who are considered to be influential in their field of expertise. Some people may refer to them as "key thought leaders" in the world of pharma and market research. 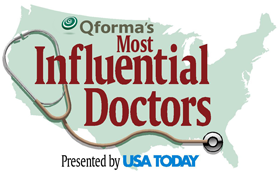 USA Today has put up a list called "Most Influential Doctors"
Here's a disclaimer: Influence does not imply a measure of quality of care, nor does this list serve as an endorsement by USA TODAY or Qforma. So, do you think your doctor is on that list? How would you rate the quality if your physician? Remember, quality is not always equal to influential. Thanks for pointing out that typo.